* Chain Reaction- The Ultimate Journey Tribute Band. 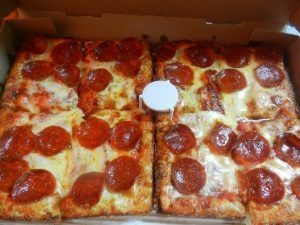 By the way just before the show, Jeff Eats and Mrs. Jeff Eats are gonna catch a couple of Sicilian slices at Jet’s Pizza, 8903 Glades Road, Boca Raton, Florida 33434, (561) 852-5700- which is something like a 2 minute drive from the Boca Black Box where Chain Reaction is appearing. Experience the look and sound of the American Super Group Journey! 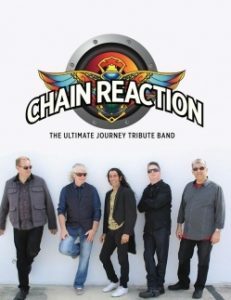 Chain Reaction – The Ultimate Journey Tribute Band recreate the look and sound of iconic super group Journey taking no short cuts to deliver the sight and sound experience of being at a real Journey concert. The band of South Florida based veteran musicians has been wowing audiences with arena rock at its finest!! Lead singer John D’Agostino is simply one of the best in the business at recreating Steve Perry’s vocal brilliance. His passion and love for Journey comes through in every performance. Every effort is made to make it look and sound like the real deal!! Grab your tickets for this awesome night reliving a real Journey concert…at the Box! ***** Jet’s Pizza, 8903 Glades Road, Boca Raton, Florida 33434, (561) 852-5700. A recent Jeff Eats’ e-mail. Not to get personal but I know that you live in Boca Raton. I mention that because I also live in Boca Raton at the Broken Sound Country Club. I was thinking that maybe you could help me out with a little football party I’m having next Sunday at my home for about 35 people. I’m thinking salads, pizzas, subs, calzones, wings and fruit/desserts. Definitely using The Boys Farmers Market for fruits/desserts. What’s your best call on the the other items? It goes without saying, looking for delicious food, good prices, reliable, close by and delivery service if possible. Got the perfect joint for you, Jet’s Pizza in Boca Raton. Over the past few weeks, Jeff Eats has “taken-out” something like 5 times from the Jet’s Pizza in Boca Raton-and I gotta tell you, that all the-stuff (pizzas/calzones/subs/salads/wings/breads) ordered was right on the money! My last- outing just 3- days ago, netted me Jet’s bread, Caesar salad, a calzone (marinara sauce/mozzarella cheese/pepperoni/sausage) and an 8 corner pepperoni pizza- all of which I would highly recommend being in your party order! Trust Jeff Eats when I tell you, that all of Jet’s Pizza’s food is delicious…it’s just a question of the menu you want to put together! By the way, there are currently 27-Jet’s Pizzas in Florida (jetspizza.com/stores/state/FL)- based on your “address” the Boca Raton store is the closest to your home. No question in my mind…Jet’s Pizza is perfect for your party! By the way, your- Boys’ pick for fruits/desserts is absolutely the way to go! Thanks for reading…and as of right now-Jeff Eats and Mrs. Jeff Eats have no real plans for next Sunday! ***** DISH OF THE WEEK (Sunday- 9/6/15). Jet’s Pizza is a national “takeout” pizza chain. I’m thinking that it currently has something like 350 stores in 17 maybe 18 states. Last week, Jeff Eats “tried for the first time and took-out twice” from the Jet’s Pizza which opened in Boca Raton-3/15. Night #1 it was the Signature 8 Corner Pizza, Night #2 it was the Signature 8 Corner Pizza with pepperoni and a Jet’s Boat (think calzone and you’ll be thinking right- stuffed with mozzarella cheese, pizza sauce, sausage, pepperoni and topped with butter/Romano cheese- $8.99) and I gotta tell you, the pizza and boat blew me away. No ifs, ands, or buts-one of the best “calzones” that I’ve ever had- as for the pizza, think Sicilian/deep dish and it was absolute dynamite. Just between you guys and Jeff Eats, if Mrs. Jeff Eats let me-do this joint twice in one week, the food had to have killed! Trust me, the lady…before I get in trouble here, let’s just leave it- that the food killed! Like I said, Jet’s is a national takeout pizza chain. Some stores have seating, the one in Boca Raton -no seating. By the way, there are a ton of Jet’s Pizza joints in Florida- you can check jetspizza.com for locations/menu/info. Just between you guys and Jeff Eats- this Jet’s Pizza is one-hot franchise with a huge number of stores currently In development! Let me wrap this up for you, that Signature 8 Corner Pizza and Jet’s Boat were terrific. Jet’s also has other types of pizzas, salads, wings, subs- so there is plenty of stuff to choose from. Jeff Eats knows his crowd- and right about now, some of you guys must be saying…Hey Jeff, you-losing your freaking mind or what? This Jet’s is a takeout chain and these kind of joints make cheap garbage-so you been smoking or something? I’m telling you guys, give this chain a shot! Ive seen the band twice and they are terrific. Ive eaten Jet’s square pizza a number of times and it’s deliciou. I saw them at a private party last month and they were amazing. Jet’s 8 Corner Pizza is terrific.